I am very pleased to welcome to GEI and to New York on his first official visit, Ambassador Claudio Bisogniero, the new Ambassador of Italy to the United States. Claudio Bisogniero was born in Rome. After graduating in 1976 with a Degree in Political Science from the University of Rome, he completed his military service as an Officer in the Italian Army in 1976-77. Immediately afterwards, he entered the Italian Foreign Service. In September of 1981, he was posted to the Italian Embassy in Beijing with responsibility for bilateral and multilateral development co-operation programs with China. From 1984 to 1989, he served at the Permanent Mission of Italy to NATO in Brussels, specializing in disarmament and international security issues. He returned to Rome in 1989 and was assigned to the Office of the Diplomatic Adviser to the President of the Republic, Francesco Cossiga, where he remained until April 1992. In this task, he covered a wide range of international issues, both bilateral and multilateral, relevant to all aspects of the international activities of the Italian President. From 1992 to 1996, he served at the Embassy of Italy in Washington, focusing on financial issues, relations with the IMF and World Bank, think tanks and defense-industry co-operation. In 1996, he was assigned to the Permanent Mission of Italy to the United Nations in New York. Returning to the home office in 1999, he served in several important positions and then in 2002, was appointed Deputy Director General for Political Multilateral Affairs. From 2005 to 2007, he was Director General for the Americas and then took up his duties as NATO Deputy Secretary General, working with a variety of security and strategic issues on the Alliance’s agenda; he also followed the NATO Summits in Bucharest, Strasbourg/Kiel and Lisbon, and worked actively in the preparatory phase for the 2012 NATO Summit in Chicago. Named Ambassador of Italy to the United States, Ambassador Bisogniero presented his credentials to President Obama on January 18, 2012. I have the great pleasure to have known Claudio Bisogniero for long time and I have followed his career on different occasions in Rome with President Cossiga, in Washington with Ambassadors Bianchieri and Salleo and in New York with Ambassador Fulci; and I have always admired his exceptional qualities and capacities to operate in different fields. 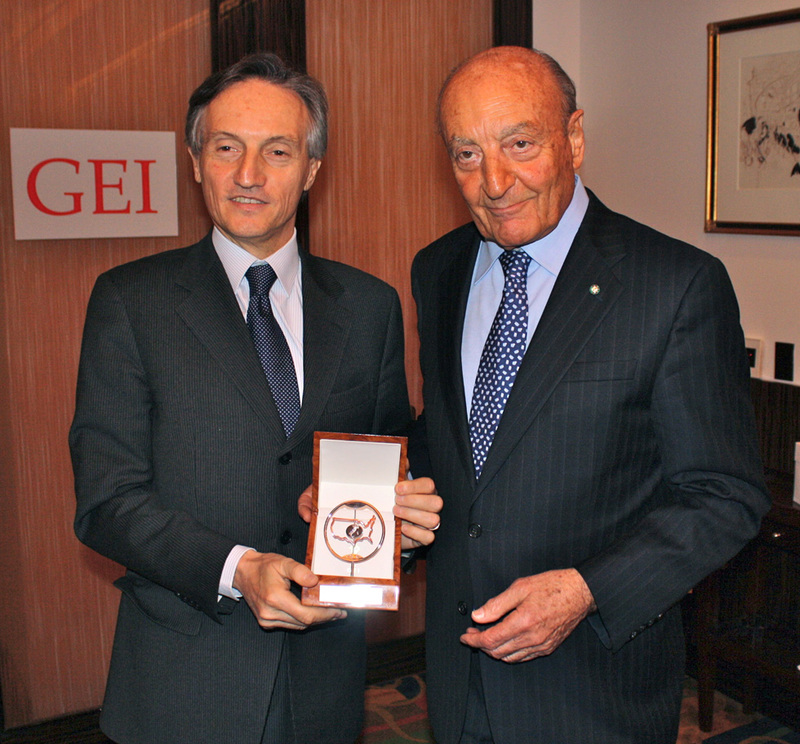 I am therefore very pleased to welcome back Ambassador Bisogniero to the U.S. and to present him on behalf of GEI with the “GEI FRIENDSHIP AWARD” in recognition of his many accomplishments in Italy and abroad. The luncheon was held on March 16, 2012 in the Stella Private Room of Le Cirque restaurant in New York City.